Orfeo has waited thousands of years for his time to come. Soon his descendant, Astrid, a mermaid fierce and true, will join him at Shadow Manse, his stronghold. Will she succeed in taking his powerful talisman, a black pearl? Or will he succeed in persuading her to accept her birthright, and turn against her friends? The fate of the underwater world is at stake in this breathtaking finale of the WaterFire Saga! Ava is tracking another talisman in the swamps of the Mississippi. To get it she will have to face down the murderous Okwa Naholo spirits. For once, her unseeing eyes might be an advantage, because no mer who looks upon the creatures lives to tell the tale. Serafina, Becca, Ling, and Neela are in the Kargjord with the rest of the Black Fin resistance and goblin troops, preparing for war on two fronts. Will Sera ever see her beloved home – and her beloved Mahdi – again, or will the Volneros take over the mer realms while Orfeo takes on the gods themselves? One of the biggest inspirations for SEA SPELL, and all the Waterfire books, was the sea itself, and its gorgeous and amazing creatures. A fictional world is created through imagination, of course. What makes books like Hunger Games or Harry Potter great? The fact that you can totally step into the world the author created. It takes a lot of imagination to do that. And one way to feed your imagination is to do research. 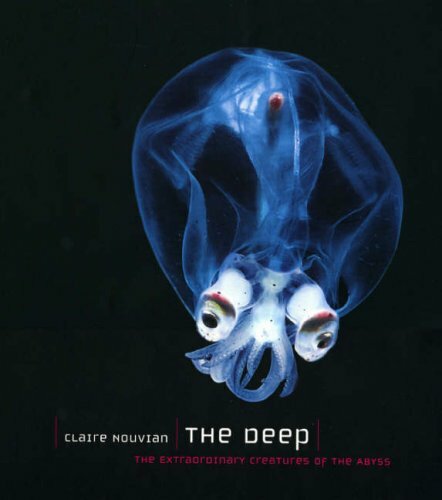 For the Waterfire Saga, I read lots of books on marine creatures and environments, including one incredible book called THE DEEP by Claire Nouvian. 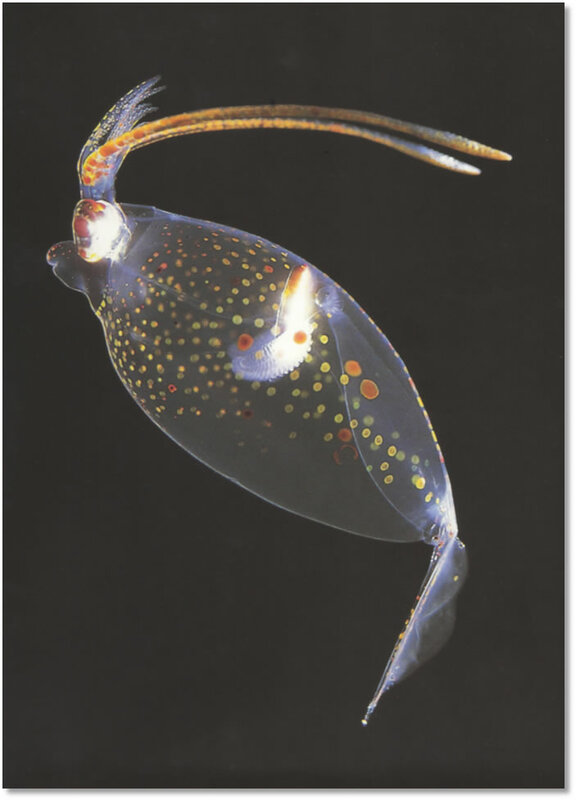 It features photography of deep sea creatures. It was so inspiring to me that I have to share a few shots from it with you because I love the creatures in it so much. This guy lives 1400 meters below the surface of the sea. He’s a bioluminescent – which means his body contains photocytes – cells that emit a bluish glow. He was a big inspiration for Neela. 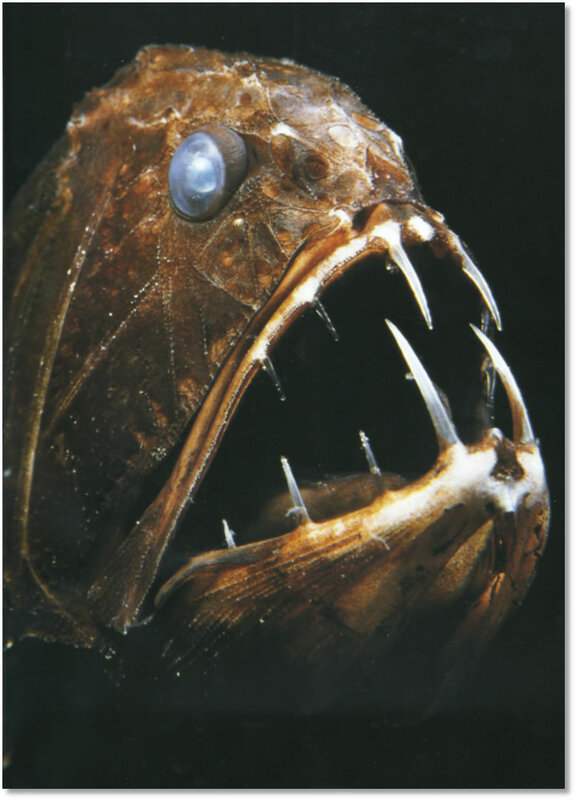 This awesome fangtooth, who’s found at 5,000 meters below the surface, can’t see, but he can feel what’s around him using the sensory canals on his skin. He helped me create Ava. She’s blind, but she has this incredible ability to feel things, to sense what’s coming. 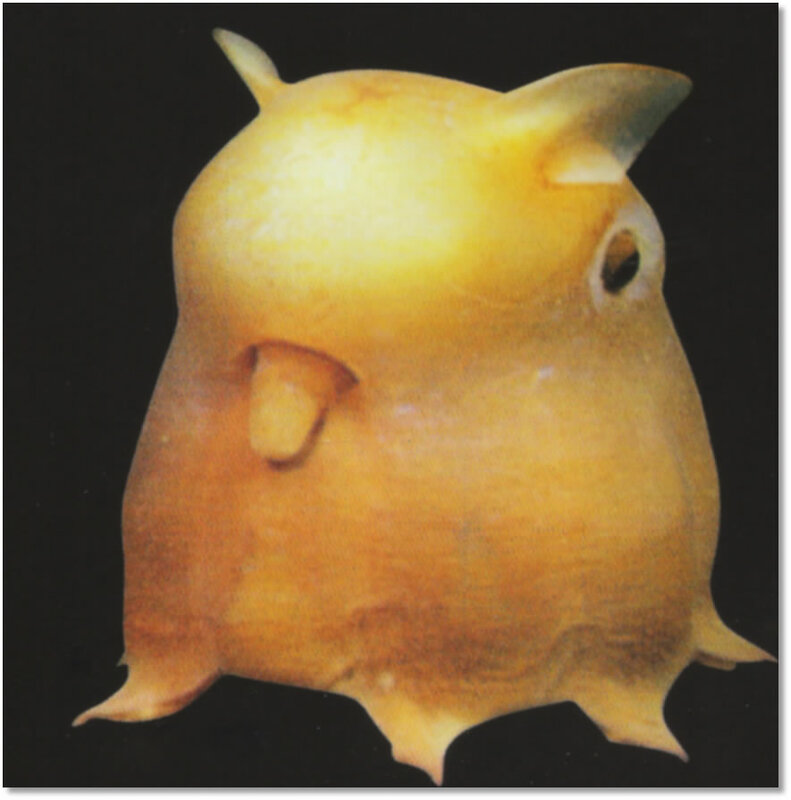 Scientists say not much is known about this little guy, but come on….I know all I have to know just by looking at him. He’s a total joker. One of these octos appears as Opie in SEA SPELL. 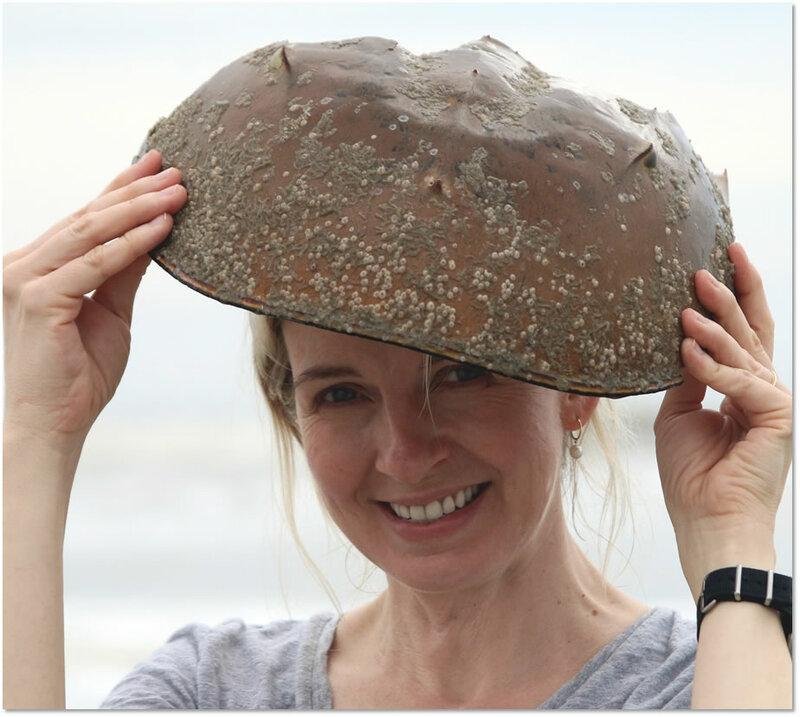 I read a lot for my research, but I also go to the world I’m trying to write about – be it a pond, lake, river, or beach—and get nose to nose with what I’m writing about. 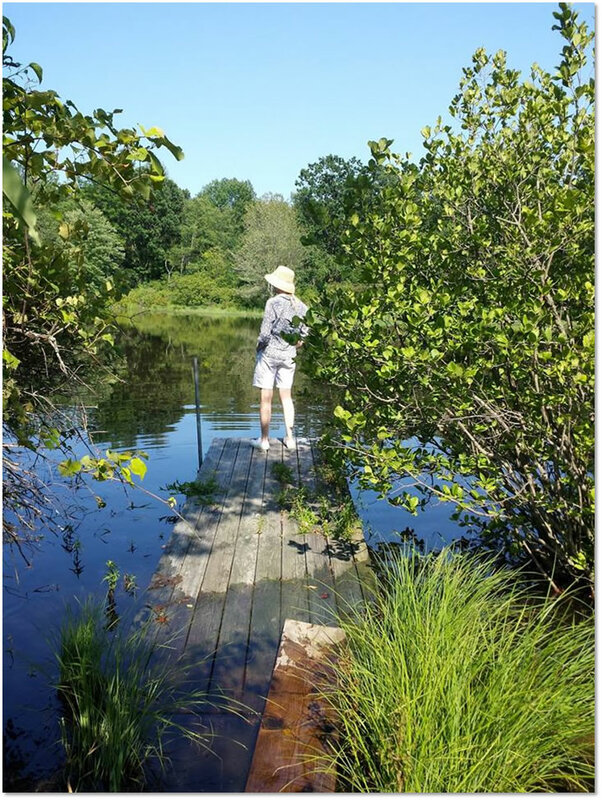 This is me at a friend’s pond. That day, I found the biggest clutch of frog’s eggs I’ve ever seen, watched fish swim, and dragonflies fly. I listened to bullfrogs call, and breathed in that wonderful, muddy pond smell. What usually happens to me, is that I’ll see all these wonderful things – and then stow them away in my brain. 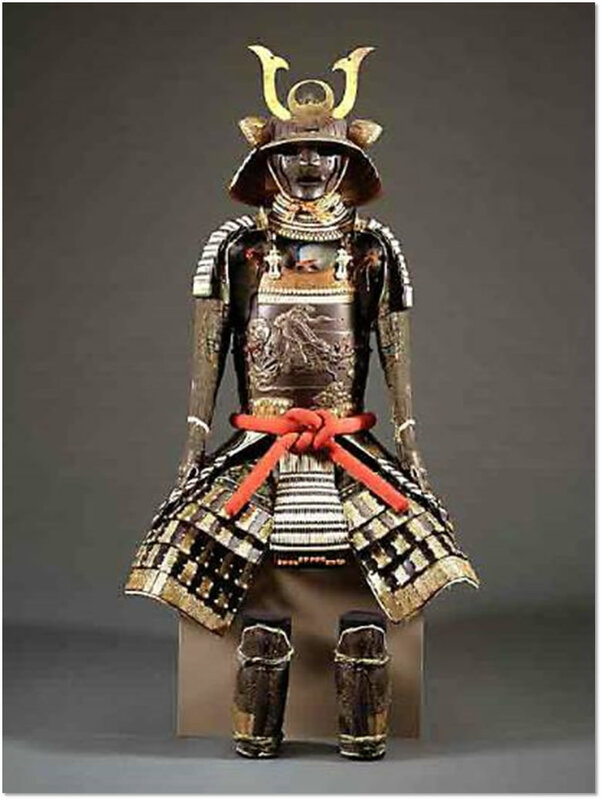 ….and boom, I knew what my mer soldiers would be wearing on their heads. I’m just like a magpie, constantly taking bright, shiny things and hoarding them until I find a way to use them. I hope you enjoy all the bright, shiny things – and the dark, scary ones, too – that you find in SEA SPELL! 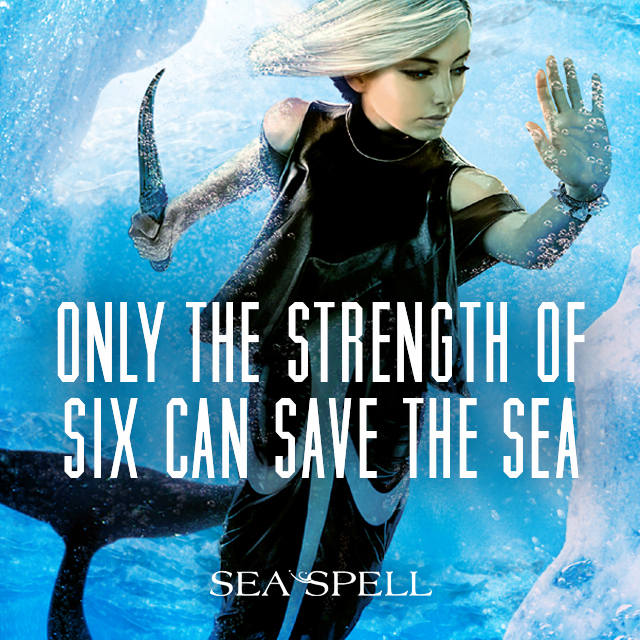 Click to read an excerpt from SEA SPELL. BUY SEA SPELL AT AMAZON.COM, BARNES AND NOBLE, OR YOUR LOCAL INDEPENDENT BOOKSTORE. I just finished Sea Spell, the 4th WaterFire Saga book. You have to write a 5th book!!!!!!!!!! After that epilogue, you just HAVE to. If the book ended without an epilogue, it would be fine, but you end with such a good cliffhanger about Lucia! You need to wrap it up! The WaterFire Saga is such an amazing series. If you don’t write a 5th book, I will. When will the audio book come out? I wish I knew — but when/if I find out, I will share the news! No immediate plans, but I miss Serafina and the rest of the merls, and I’d love to see what they’re up to … so maybe one day!! I need a book 5. My heart is broken not knowing what Lucia is cooking. And I want to know more of becca and Marcos romance. Omg I just finished book three! I know I have anouther book for the water fire saga but I’m already sad that there is only one more book! I I would really love to see a book five all my friends have read these and I know they are just waiting for book five as soon as I see something exciting in these books I immediately text my friends! I hope we can all see a book five soon! I can not tell you how happy I am to read your Waterfire saga. 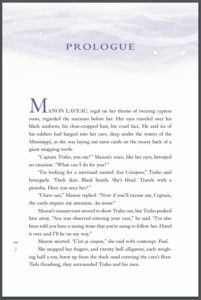 As a diver and author in my spare time, your story of the 6 mermaid’s individual journey was truly unique and beautiful. The Waterfire Saga hit something in my heart and expressed my own love for the ocean and imagination as only very few book series have ever done. I’ve probably never hated villains and supported the heroes as much as in your story. And it was a pleasure to read their travels. Your writing style is very interesting because you can switch between sweet moments, to real evil and tough consequences that reflect real life. Your ending of the Waterfire Saga 4 was beautiful because you showed that even though the match was won, evil always lives on like goodness. Expecially about Becca and Marco’s relationship and what consequences it could have for the sea and both of them. And of course on Lucia’s evil revenge. Who once Miromara’s throne did seize. She plots and plans her next attack. Hope so you will continue the story one day. You’re welcome, Casper, and thank you for this lovely note! I don’t have any firm plans to continue the series, but I miss those merls and I’d love to catch up with them — so maybe one day!! I have been inspired by Waterfire Saga for sooooooo long! It’s what started to get me drawing. Every time I run out of inspiration, I grab one of your books and start reading. I (and a lot of other people) hope you make a 5th book (or are currently making one)! PLEASE PLEASE PLEASE PLEASE PLEASE WRITE A BOOK 5 PLEEEASSEEEEEEEEEEEEEEEE!!!!!!!!!!!!!!!!!!!! We’re all waiting for a 5th book. It was truly the best book I’ve ever read no doubt. Please make a 5th book! I can’t wait to see what Lucias brewing.